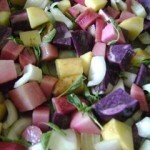 If you think winter vegetables have to be either beige and white or else frozen, think again. 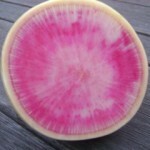 There are so many bright, vibrant colors in the spectrum of winter veggies that there’s no excuse for boring dinners. 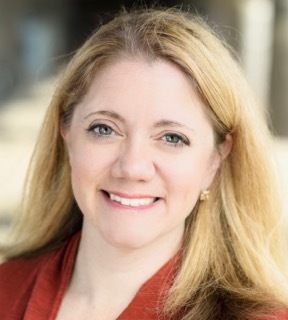 The good news for your kids? They don’t have to get saddled with bland or frost-bitten veggies. We do have one advantage here in Los Angeles that others might not have: farmers’ markets that bring growers from across California to showcase their most beautiful specimens. For a great slide show on what’s available in L.A., click here (via L.A. Times food section). 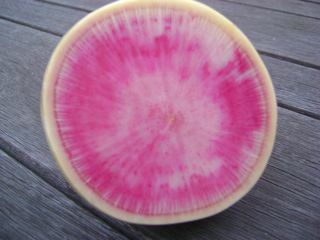 Check out this brilliantly hued watermelon radish, for example. Who knew that was one of winter’s treats? But even if you’re not near a farmers’ market, you might still be able to find some great varieties of winter vegetables at local ethnic markets or organic or specialty grocers. 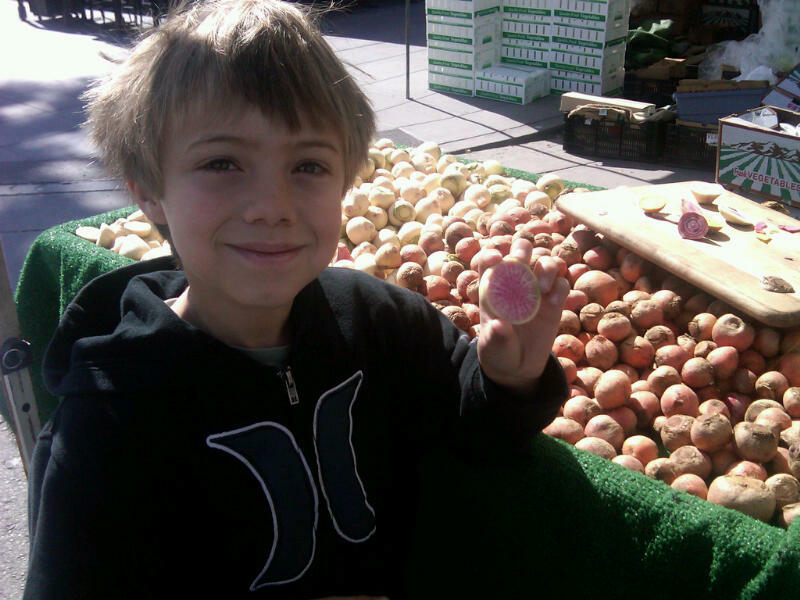 To prepare for this week’s Fun Food Saturday, we drafted our 7-year-old to come with us to the Santa Monica farmers’ market and serve as arbiter of all things cool. He immediately latched on to the watermelon radish and even tasted it willingly. He was thrilled by the multi-hued carrots and gladly sampled one of each. He picked out beets in four different colors. He begged to buy another romanesco (even though he didn’t want to eat it) just because it is so cool to look at. He even enjoyed picking out different varieties of potatoes, plus some oregano as the herb we would use for roasting. Unfortunately, his open-minded spirit faded before the potatoes were finished and he lost any interest in eating them (note to future self: Give him credit for trying as much as he did, rather than giving him a hard time for losing momentum). Most of the produce we picked (carrots, radishes) was at its best when served fresh and raw. 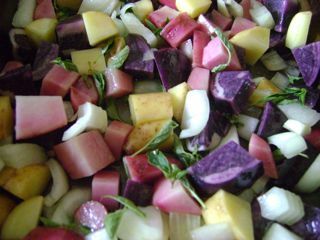 For the potatoes and beets, we cubed them, tossed them with extra-virgin olive oil and fresh oregano, and then roasted them at 375 degrees for one hour, giving them a good stir at the half-way point. For the greens like kale or Swiss chard, we chopped them and roasted them (alternatively, you can saute them in olive oil with garlic on the stovetop). 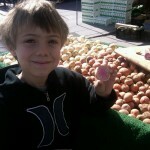 And then we quizzed the kids: How many vegetables can you name that are pink? 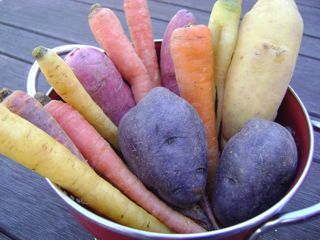 How many vegetables can you name that are purple? 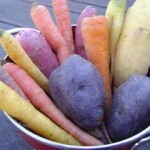 How may colors can you eat in one meal? Did you know that winter could be so colorful?